Neck pain when you get up in the morning? How many of us have woken up in the morning feeling pain in our necks? It’s never pleasant, is it? Indeed, it can even be very painful. Neck pain can range from merely being slightly bothersome and gone in a short while, to being an indication of something more serious. But many times, the culprit behind neck pain can be traced to what we put under our heads when we sleep. I wrote this article because I decided to go on a personal quest to find the best pillow for neck pain. The older and more experienced I get, the more I realize that there are certain products out there that are tailored for our wellness and comfort. Yes, you can actually avoid a pain in the neck, figuratively and literally, by getting the best pillow that suits your sleeping style, so you can wake up refreshed, relaxed and ready for your day. So you can choose for yourself what’s best for you. Now, we’re talking about the best pillow for neck pain and headaches for your bed here, since we’ve already tackled travel pillows elsewhere. As a frequent flyer, I’ve made it my business to look for the best travel pillows around, ones that eliminate dreaded neck pain when you fly or ride the bus or train for many hours, no matter how cramped your seat is. We can expect a certain level of discomfort when we travel, right? But when we sleep, we expect to be as comfortable and as pain free as we can be, because rest is really important in these busy, stressful days. Finding the best pillow for neck and shoulder pain, therefore, is at the top of my priority list. But if you’re interested in getting the best travel pillows for neck pain and headaches, you can check it out here: Best Travel Pillow. Why we have neck pain? Are you even lying down the right way? From this table below you can choose the best pillow for Neck Pain that will give you a value for your money. 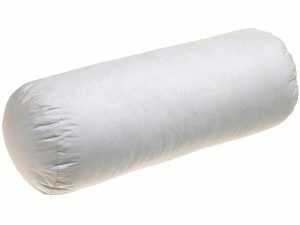 Does the Sleep Whale, a shredded memory foam pillow with a bamboo/polyester cover, help eliminate neck pain and really cause you to sleep well? Let’s find out. Let me start by saying that this pillow is very firm, and if you’re used to the softness of down and polyester pillows you’ll actually find this one to be on the hard side. Additionally, it is also quite heavy. So if you’re not a fan of firmer pillows, this one may not be for you. It’s also quite thick, which may be a problem for smaller people or children. And, because it’s made of shredded memory foam as opposed to one whole block, you can feel the material shifting around when you lie down on it. Since the material shifts around a lot, sometimes you wake up in the middle of the night and have to plump this pillow in order to get comfortable again. In the world of pillows designed to prevent neck pain, I thought the Sleep Whale looked promising. Number one, it’s made of memory foam. Number two, it’s got a bamboo cover protector that is supposed to allow the memory foam to breathe and stay cool, unlike traditional memory foam pillows that can make you really hot. Number three, it’s hypoallergenic, resistant to dust mites, and can be cleaned in the washer and dryer. So it should be a win all the way, right? Let’s see. In the past I’ve used the Tri-Core Neck Support Pillow for the pain in my neck and head, and was wondering how the Sleep Whale would hold up in comparison to the Tri-Core. The Sleep Whale comes in a vacuum packed bag, with instructions to put it in your dryer to fluff it up. And does it ever fluff up! It grows huge after just a few minutes. And yes, while it is big and firm, it is also surprisingly soft and fluffy. The firmness really gives you good neck support, which means no pain the next morning, which was the biggest bonus of all. The cover is also very pretty, and soft to touch. (The cover would actually make a nice pillowcase on its own.) And it really does feel cool, and keeps you cool through the night. And the Sleep Whale has no chemical smell, unlike other memory foam pillows. The nice thing too is that you can remove some of the shredded memory foam stuffing if you feel the pillow is too thick for you. It worked well with both the side and back sleepers in the family (it’s too thick for tummy sleepers). There is so much to love with this pillow, starting with the fact that it’s a big help for people with neck pain. But it’s probably not for everyone, because of its firmness and thickness. However, if firmness and support are what you need and want, then this pillow is a great choice for you. One more thing in it’s favor, in comparison with the Tri-Core Neck Support Pillow, the Sleep Whale holds up very well, even after months of using it every night. One of my main problems with the Tri-Core is that it lost its firmness very quickly, which I am happy to say, is not the case with the Sleep Whale. Honestly, I love the concept of this pillow. After all, if we’ve used coils and springs in mattresses for a long time, why not in pillows, right? And this pillow really is quite soft. It has 40 individually wrapped heavy duty, resilient springs that move independently from each other. A pillow with individual springs to cradle your head seems like a good concept. However, this pillow from Oxa is a little on the flatter than some pillows. Additionally, if you turn the pillow over you can actually feel the springs, so you should only use one side of the pillow. Because it has springs, it can’t be washed either by hand or by machine. It needs to be laid out in the sun frequently to keep it clean, and regularly fluffed so it retains it shape. Is it worth the price? It works for back, side and stomach sleepers, because the springs keep your head cradled in such a way that your neck and spine are well aligned. It’s even supposed to work well for pregnant women. Its cover is made of breathable material, and so you are kept cool all night long. Plus, it relieves neck and back pain as well as migraines. This spring bed pillow is amazingly comfortable, because it manages to be soft and firm at the same time. What can I say, the springs really work! It’s not the fluffiest of pillows, but it does come in at a decent enough 5-inch thickness, and when you touch it, it has a luxurious feel. Again, it’s the springs that make the difference. And, no matter what position you’re in, the pillow adjusts to you and gives you unparalleled comfort. Because let’s face it, nobody sleeps in just one position, right? It’s nice to know that there’s a pillow that stays comfortable no matter how much you toss and turn. Two things make this pillow worth it — it contributes to deep sleep and helps relieve back and neck pain. It’s always lovely to wake up pain free. To sum it all up, let me say this. Since comfort, getting a good night’s rest, and staying pain free is very important to me, I’d say this pillow, especially with it’s 20-year warranty, is pretty much worth it. It’s not a perfect pillow, but I have no doubt that with the fast pace that technology is moving, the people from Oxa are developing an even better spring pillow that can be used on both sides. With AirCell technology, will this contour pillow keep me cool all night long? Hmmm, let me start with what doesn’t work for me. For one thing, the smell. Now, the manufacturers do say that when you open it you might experience a “fresh foam odor” that, when exposed to open air, dissipates within 20 minutes. In my opinion, “fresh foam odor” is a really optimistic way of putting it, because the smell can be quite strong. Another issue is that the pillow itself can’t be fully cleaned in the washer, and should only be wiped by a damp rag, which doesn’t make me too comfortable, knowing that dead skin cells and dust mites can hide in pillows. So, worth it or not? I must say though that this pillow does have a lot going for it. It’s actually a three-part pillow: the outer and inner covers, which are both washable, and the foam pillow itself. The covers are both very soft to the touch. The pillow is completely non-toxic, despite the smell, and in answer to my issue with how dirty the pillow can get, the foam is treated in such a way that it protects against allergens like bacteria, mold and dust mites. Its contoured design has one side that is low and one side that is high, so that it suits back, side and tummy sleepers. It’s got a great cooling and warming functions because of the Aircell gel-infused covers. One side is for the summer and the other is for winter. Best of all, the memory foam in the pillow is infused with gel, which helps relieve stiffness and pain in the neck and shoulders. And, as a side bonus, you get a sleep mask thrown in for free when you order this pillow! I compared this pillow with Sleep Innovations’ Cool Contour Memory Foam Pillow, since they were made of the same material, and also presented the cooling factor as one of the pillow’s attractions. My main problem with the Sleep Innovations pillow is that it starts out really firm and takes a few minutes for the pillow to soften and adjust its contours to your body heat. In other words, you’re not comfortable right away. With the Cr Sleep Ventilated pillow, you don’t have this problem. Once you lie down on it, you can find a comfortable spot much away. Plus, it’s only half the price of the Sleep Innovations pillow. Now, I just have to say that the best pillows are a combination of softness and firmness, and for that, this pillow is a winner. I like it that it has both thick and thin sides, and so, whatever position you choose to sleep in for any given night, this pillow works for you. The price point is pretty fair too. And the fact that it cools you in the warm months and keeps you warm when it’s cold outside makes it a winner in my book. It’s a great pillow for comfort and pain relief, since it’s both soft and firm. Good features all around. The smell does go away after a while, and if you’re concerned about germs since you can’t really clean this pillow, I suggest throwing it out after a year or two. Does this cervical pillow take away my pain in the neck? This pillow has that supposedly “fresh foam” smell that takes a little bit of time to get rid of. It needs to be aired for a few days, and so you can’t really use it immediately when you buy it, unless you’re okay with the smell. Also, it felt just a little smaller and flatter than standard pillows. And, as with other memory foam pillows again, you cannot wash the foam itself. However, this is a pillow that appeals to me. Neck and shoulder pain relief — check. Made for side-sleepers — check. Made of memory foam, but with a cooling component — check. Has uneven sides, so that on the days when I need more support I can use the high side, and the low one for the days when I don’t — check. What more could I ask for, right? It’s contour wave design is probably its best feature, and while it’s advertised as a pillow for side sleepers, it works well for back sleepers who can use the 4-inch higher side, or stomach sleepers, who can use the 2.8-inch lower side. The gel-infused memory foam also works well for relaxing my neck and shoulder muscles, giving me just the right amount of pressure in cradling my neck. It’s supposed to be anti-bacterial and allergen-resistant, and so, even if I can’t wash the foam itself, that’s some amount of comfort. The soft white cover it comes with is completely machine washable, though. I wanted to see how this pillow held up to Tampor’s Memory foam Pillow Cool Gel Contour Pillow for Neck Support — since it’s also a cooling, contoured, memory foam pillow. 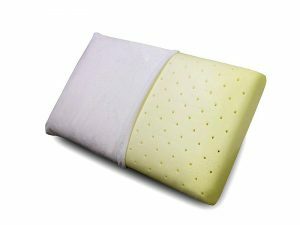 One thing about Tampor’s pillow is that after a just a few weeks, it no longer offered me the support I needed, and deflated pretty quickly, while this Side Sleeper Memory Foam Pillow pillow consistently gave me good support on its high side whenever I needed it, even after I used it for a long while. Another nice thing about it is that the bottom part is perfectly flat, and so I have no worries that it will travel all over my bed and end up on the floor in the morning. It also has good airflow, and keeps my head cool at night. It also comes with the added bonus of a very soft and comfy eye mask thrown in. The feel of it is medium firm, and so if you’re looking for either super soft or rather firm, this may not be the best for you. What I really love about it is its versatility though, because I don’t always have the same amount of neck pain all the time. With this pillow, I can choose which side to use depending on how I feel. If you are someone who wants an enormous fluffy pillow like they have in hotels, then this pillow is not for you. But if you’re looking for a versatile, contoured, cervical pillow to relieve some of your neck and shoulder pains, give this one a try! The price is not too expensive, and if it gives you a good night sleep, it’s definitely worth it. A pillow recommended by orthopedists and chiropractors — can it solve neck pain issues? Okay, I am primarily a side-sleeper, and right away I can tell that this pillow is more for back sleepers than for people like me. If you shift back and forth from your back to your side to your belly when you sleep, this might work for you. Having an adjustable thickness is nice, but when I tried to remove some stuffing, zipping up the pillow became a problem, as the fluffy stuff easily gets stuck in the zippers. As for the price point, hmmmm…that is a quite a shell-out of cash. Like I said at the beginning, it’s a serious pillow with a design recommended by medical professionals, with a contour for maximum neck support. It guarantees spinal, neck and head alignment while you’re sleeping. And it’s adjustable — you can put in as much or as little stuffing as suits you. It’s obviously not your big, fluffy, traditional pillow. This pillow is tailor-made for people with issues with neck and shoulder pain, and who need additional good support when they sleep. With a neck roll cushion built into the design, this is a pillow that promises to keep your head, neck and spine aligned. And since, most people do shift from back to side when they sleep, this pillow will work for them. It’s got a gusseted design on the edge that makes shifting from back to side and vice versa very easy. Additionally, one of the most important features of this pillow is that it is fully adjustable — something I haven’t seen in any other pillow. You can adjust the filling level of the side and neck area to what suits you best. Let me say this too, I liked this pillow a lot better than Core Products’ Tri-Core Orthopedic Neck Support Pillow, which operated on similar principles, but was not adjustable, and lost its shape after a few months of using it. This pillow is made up of all natural materials, so it’s environmentally friendly, and it also means that it doesn’t have the chemical smell that memory foam does. As an added plus, the company that manufactures these pillows has said that ten percent of their profits from these pillows are donated to global humanitarian relief. And finally, if you’re unhappy with this pillow you can return it within 30 days and they’ll give you a refund, no questions asked. This is important because this pillow is not cheap, so a money-back guarantee is comforting. Let’s do a run down of its pros and cons. The verdict: This pillow is for you if your mainly sleep on your back and only move to your side occasionally, and if you have issues with pain in your neck and shoulders. It is pricey, but, it does come with a 30-day money back guarantee, so if you don’t like it, it’s no big loss for you. This is a thick, fluffy latex foam pillow that promises maximum comfort as well as spinal alignment — it’s almost sounds too good to be true. First of all, compared to contoured and cervical pillows, this one looks huge, to the point that some might even think it’s too thick to be comfortable. And yes, there is a slight chemical smell because of the latex. It comes with a cover that doesn’t seem too sturdy. This cover can be washed but I would recommend the gentlest setting on your washer or even hand washing it because it looks a little fragile. The latex pillow itself is unwashable, and can only be spot cleaned with a damp rag. But, having said all that, this latex pillow is pretty amazing at maintaining its shape. It literally bounces back after you sink into it. It’s soft, but not too soft, and doesn’t retain heat like memory foam does. It’s not contoured, and so you can flip it in the middle of warm nights and still get the same amount of comfort. You won’t have to fluff it up in the same way you would need to with a down or feather pillow. It seems pretty durable and retains its shape well. 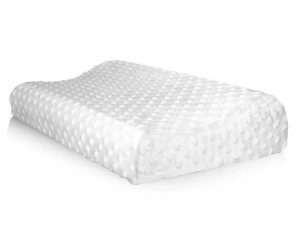 Some people have been using their Beautyrest latex foam pillows for several years and the shape, softness and springiness are still the same. Does this latex pillow work for my neck pain? Surprisingly, yes. I like the elevation of high pillows when I read or watch TV in bed, and this one comes in at more than 5 inches. In the past, when I’ve used high pillows I’ve ended up with a sore neck, and so I’ve had two pillows stacked for reading, and then I remove one before I sleep. With this pillow, there’s no need for me to have two and then remove one, as it adjusts to the weight of my head and so I have the elevation I want, but the support that my neck and shoulders need. It is designed to relieve not just neck and shoulder pains but even headaches. Additionally, the manufacturer says this pillow has antimicrobial properties, and resists smells and bacteria, and so it will stay clean for the hopefully many years that you’ll be using it. Let’s see this pillows pros and cons. If you like spring more than sink when it comes to pillows, this may be the right one for you. And if it does work well for you, if you take good care of it, it will last you for many years. Make sure to spot clean and air it often. The 100 percent cotton cover may need to be handled with extra care, and so, use a sturdy pillowcase to protect your Beautyrest pillow. What’s so special with a pillow that has the latest in memory foam technology? Okay, right away, for some people “medium firm” actually translates to “way too firm.” Most people expect to sink into a pillow’s softness, which doesn’t really happen with this one. As pillows go, it’s quite high, firm, dense and heavy. Also, it has the same “off-gassing” problem that most memory foam pillows have — the chemical smell here is quite intense, and does not leave quickly, unfortunately. It has a velour knit inner protective cover than can be taken off and machine-washed easily, but the pillow itself cannot be washed. This is a medium-firm ventilated pillow that uses the latest in memory foam technology. It provides support, comfort and coolness, and is resistant to allergens and dust mites. It also helps relieve pain from your head, neck, shoulders and back. To be fair, this pillow does have a lot of things going for it. It’s a really good pillow for back and side sleepers who prefer and are more comfortable with firm rather than soft pillows. It’s made up of 100 percent imported polyester and provides relief and support for your head, neck and shoulders. And because of the ventilation in the memory foam, it keeps your head and body cool while you sleep. The pillow’s material resists dust mites, mold, bacteria and other allergens. If you are someone who needs support for your neck and shoulders, this may be a good choice for you. The firmness may take a while to get used to, so you’ll need an open mind for the first night or two. The memory foam cradles your head by conforming to it’s shape, allowing you to relax and get a good night’s sleep. And this pillow certainly is durable, some people have used theirs for three years and longer. And since I’m a side sleeper and higher, firmer pillows usually work better for people like me, this pillow is a good choice. Okay, let’s review the pros and cons for the Conforma Cushion Firm Memory Foam Pillow. To sum it all up: If you’re most comfortable with a firm pillow, and you need the support that this kind of pillow can give you, then why not give the Conforma Cushion Pillow some serious consideration? It’s very helpful in causing you to relax your neck, head and shoulders, while giving you the support you need. And, in comparison to higher-end memory foam pillows, the price for this one is very reasonable. This one is definitely worth a shot if a firm pillow is what you’re looking for. How well do neck rolls work anyway? When having a bed pillow isn’t enough and you need extra support for your neck whether for sleeping, reading or watching TV, a neck roll like this one is a possible alternative or addition to your bed. Well, first of all, I have to warn you, these neck rolls are quite big, firm and bulky. They are 16 x 6 x 4 inches, which might be a little much for an average sized person. Secondly, they don’t come with a cover and the zipper is exposed on them, and so you’ll need to find some covers that fit, have some sewn, or make your own. And so obviously, if you’re looking for neck support or trying to relieve neck and shoulder pain, this shouldn’t be your primary pillow. This too, the filling can get a little lumpy after a while, and will need replacement. These are lightweight, sausage shaped pillows that have 100 percent cotton covering and imported hypoallergenic polyester stuffing. The cotton cover has a very soft 233 thread count. They are machine washable and don’t require any special care for cleaning or maintenance. With the right cover, they can even serve as decorative pillows for your bed. This is the beauty of these neck rolls: if they are too high and thick for neck support, you can use them for other purposes. They are extremely versatile because of their shape. Side sleepers can put them between their knees, or even under their chins for additional neck support. When your legs need extra elevation, you can use these pillows to prop up your legs easily. They can also be used as body pillows for hugging, cradling, or back support. They can also be used under your neck when you get a massage, or put on your chair for leaning on to give you lower back support. They can be kept in the car for naps on long trips. The price point is excellent as well, which is great value for money, since they are surprisingly good at holding their shape and firmness for a long while, before they get lumpy. Okay, here are the pros and cons of the Newpoint Pillow Pairs. 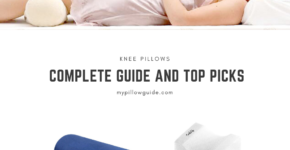 In a nutshell: Great support pillows for sleeping and many other activities, but will probably not take the place of a really good pillow for sleeping. Is the NeckBone really the most effective chiropractic support pillow? First of all, it certainly won’t and can’t replace a really wonderful bed pillow that you can sleep on for hours, unless you have pain issues in your neck and you need the parts of the dogbone design to provide pressure on certain parts. It’s also really firm, which means it’s not for everybody, since people generally look for softness in a pillow. It’s great for support and convenient for traveling, but it’s not going to be everyone’s cup pf tea. The NeckBone has been around for a very long time, and a lot of people who have had pain issues in their necks due to accidents or different medical conditions consider it to be really helpful for them. It comes in a trademarked dogbone shape with a strap at the back that can be attached to chairs so it won’t slip off. It is, first and foremost, what it advertises itself to be — a chiropractic support pillow. It recently got an upgrade in the sense that newer models come with a zipper that allows you to remove some stuffing to make it more comfortable for you. The elderly, in particular, seem to appreciate the neck and lower back support that it gives. There are a lot of cervical and chiropractic pillows aside from the NeckBone out there, including Arc4life Cervical Linear Traction Neck Pillow, which has a V-shaped indentation in the middle and is supposed to cradle your head and draw it away from your shoulders. But here’s the main difference between the Arc4Life pillow and the NeckBone. With the NeckBone you always feel like you’re sleeping on something solid, and it holds your neck very firmly indeed. Arc4Life’s pillow feels great at the start, bit after a few weeks it felt like it could no longer support the weight of my head, and I would wake up in pain instead of feeling relaxed. If you have regular back issues and you wake up with some pain regularly, why not give this a try? As to the issue of it being uncomfortably firm, we need to understand that this is how this pillow actually works. The edges of the bone shape keep your neck and head fully aligned, giving your neck and shoulder muscles a chance to relax. It may not be the most comfortable position to sleep in, especially if you’re trying out the Neck Bone for the first time, but it you are looking for relief from neck, shoulders and back pain, it may just work out well for you. An excellent chiropractic pillow with solid support. Best for people with serious pain issues in the neck, as it maintains spinal alignment and provides relief form pain. Un-beatable price point, so you get excellent value for money. Easy to clean and maintain. May take a little getting used to because of its odd shape, but once it works for you, you might find this little pillow to be an irreplaceable part of your sleep routine. 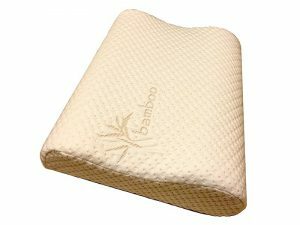 A bamboo-polyester memory foam pillow, especially designed by an experienced chiropractor, that is the most expensive on our list — is it worth it or not? Well, this pillow has a double contour, with a high side and a low side. I was okay with it, but I can imagine that smaller people might find it too big. On the firmness spectrum, this one falls on the definitely firm side, which may not work for everyone. Personally, as I’ve said before, I really love soft and fluffy pillows, but they’ve not always been kind to my neck and shoulders. The price is also a bit of a concern, a lot of people may find to be out of their price range. Having said that, though, it is a perfectly lovely pillow. It’s one of the few memory foam pillows that does not have the chemical smell, and therefore needs no extra time for airing. I remember getting Sleep Innovations Cool Contour Memory Foam Pillow, and nearly having an asthma attack at the strong chemical smell. You better believed that I returned that pillow as soon as I had a chance. So it’s such a relief to be able to use a memory foam pillow with no smell. 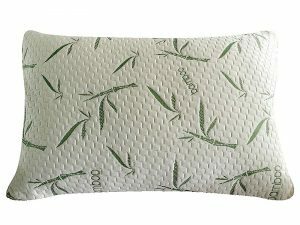 And because the cover is made of a bamboo-polyester blend, it keeps the pillow cool to the touch, so you don’t have to worry about waking up in a sweat, especially in warm months. The cover can be removed and completely machine washable too, which is very convenient. It’s hypoallergenic, dust-mite resistant, and environmentally friendly. Get this too — whether you are a side sleeper or a back sleeper, this pillow can work for you. This pillow was designed by a chiropractor with many years of experience, which is maybe why it has a different, high-quality feel to it. The pillow’s contours assure you of good spinal alignment while you sleep. The manufacturer guarantees durability, saying that this type of memory foam will keep its shape for years to come, as opposed to shredded memory foam, which can become lumpy over time. And because I am a side-sleeper, as I’ve mentioned before, using the thicker side of this pillow works for me, because it causes my shoulder to stay slightly under the pillow, giving me good support. So, let’s look at some pros and cons with this pillow. It has no memory-foam smell (no extra airing time needed)! So what’s our final word on this pillow: Well, if you are willing to splurge a little bit on an excellent pillow for your bed, you might consider this one right here. It certainly has a lot going for it, especially if you’re a side sleeper. Since we spend one-third of our lives in bed anyway, it may just be a really good investment for you. On the mornings that we wake up and there’s pain in our necks, it’s usually because our necks have been twisted or they stayed too long in one position without our pillow supporting our necks properly. Our necks should be in “neutral” position when we sleep, which means that the slight natural curve of our necks stays unchanged. Our necks are made up of seven very small bones, along with muscles, tendons and cartilage. They do the important job of holding up our heads, which can weigh up to 5 kilos, as well as protecting our central nervous system. Maintaining a pain-free neck means keeping our necks aligned with the rest of our body, particularly our heads and backs, which happens when we have the right pillow. This is the reason why selecting and using the best pillow for your sleeping style is key to staying healthy and comfortable. But what about headaches? Is there a connection between the pillow you have and waking up in the morning with a headache, instead of feeling rested? The answer to this is yes. Your pillow can definitely contribute to waking up with a headache in the morning: check out out here. Researchers have found out that irritated nerves in the upper neck may be the cause of pain in the temples, forehead, behind the eyes, or even other parts of your head and face. What’s worse is that additional pressure on those nerves can trigger a full-blown migraine that can last for hours. The right pillow for you keeps your spine aligned with your head and neck in its natural position, giving fewer chances for nerve irritation and helping protect your spine for a long time. 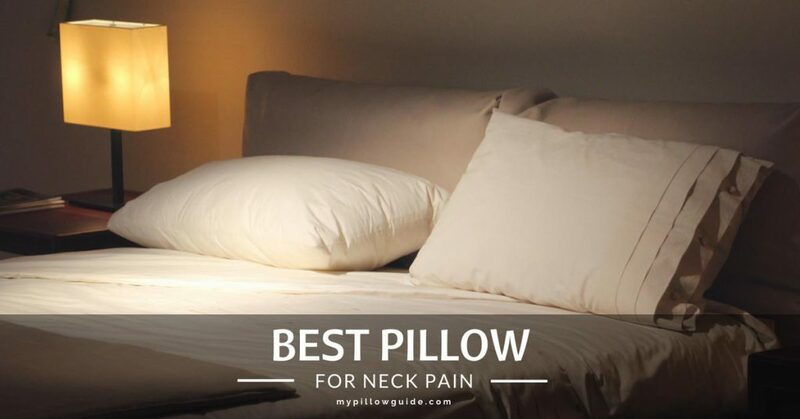 To know more about the best pillows for neck pain, you may want to check out the following links. How Can Soft Pillows Cause Neck Pain In Side-Sleepers? Here’s something that may come as a surprise to you: not all pillows are created equal, and there are actually very many kinds of pillows available on the market today. There are the ordinary fluffy bed pillows that everyone seems to use, but these come in all kinds of different filling materials. Then, there are also contour pillows, orthopedic pillows, cervical pillows, pillows for side sleepers, pillows for stomach sleepers — the list goes on and on. But the focus of this article is what the best pillow is for YOU — to give you a truly restful sleep with your head, neck and body aligned, so you can wake up energized and refreshed, ready for the demands of your day. But some of you may have the lingering question in your heads as to whether or not the right pillows can eliminate neck pain. Let’s quickly look at some myths and facts, shall we? Myth nr.1: It doesn’t matter what pillow you choose. Definitely untrue. Your pillow can determine whether or not you get a good night’s sleep! Using a regular pillow in a hotel room for one night is not so bad, but when you are prone to neck pain, getting the right pillow for you and using it every night can make a lot of difference and can determine if you’ll wake up without neck pain. Fact nr.1: Your sleeping position determines the type of pillow you need. Absolutely true. People who sleep on their stomachs generally need thinner pillows than back and side sleepers, because sleeping on your stomach is hardest on your neck. Myth nr.2: The more pillows the better. For decor—yes—plenty of pillows can make your bed pretty. But for comfort, more is not merrier. If you fall asleep on too many pillows stacked up on each other, and end up misaligning your neck, chances are you will wake up with a painful neck, or maybe even a headache. Fact nr.2: You need to change pillows regularly for maximum comfort and minimum neck pain. Technology today has made pillows built to last to up to two or three years, depending on the quality of the pillow. But, you must make sure to wash your pillows regularly and keep them clean, and if you have allergies, you may want to change pillows at least once a year. Now, conventional wisdom has said for years that feather pillows are effective in preventing neck pain. What do you think? Is this a myth or a fact? The answer is… yes, there is some truth to this statement. Because feather pillows follow the natural shape of your neck, they are quite effective pillows for neck pain. The one drawback of feather pillows, however, is that they get flatter the more they’re used, and therefore need to be replaced yearly. First, determine your sleeping style. According to this article from Harvard Medical School, the best sleeping positions for avoiding pain are sleeping on your back or on your side. Stomach sleepers, I’m sorry to tell you that your particular position is the most prone to neck pain, since it forces your neck to be twisted to the side for hours at a time, and doesn’t allow for much spine support either. But don’t worry, if you do sleep on your stomach, there’s good advice you can follow to minimize the strain on your neck so you can wake up without pain. You might want to start changing your sleeping position, though. Experts say it takes only 21 days to form a new habit! If you sleep on your back — opt for a thin rather than a thick pillow. This will prevent your head being positioned too far forward, which can cause painful misalignment. And, if the pillow has a space that cradles your head at the bottom part, this is a good pillow for you. If you sleep on your side — choose a firmer pillow instead of one that’s too soft. You need this because there is a considerable distance between your ear and shoulder on the side your sleeping on, and a good pillow will make sure that distance is filled up. If you sleep on your stomach — go for a really slim pillow, one that’s nearly flat. In fact, you might choose to sleep without a pillow under your head, but have one below your tummy, so that your lower back won’t hurt when you get up. Buckwheat… feathers… memory foam — what’s the best pillow for neck pain and headaches anyway? Next, consider the different fillers that pillows have. There are so many stuffing materials available today—from down-feather, to polyester to different kinds of foam. Recently more memory foam and latex pillows have become available, as more and more people have wanted added support for their necks. How do you know what’s best for you? Well, it really does depend on how you feel on any given day. If you’re someone who occasionally deals with neck pain, you’re going to want a certain pillow when you feel you need more neck support, but on other days when your neck feels just fine, you may want to revert back to the pillow that offers you the most comfort. So, why not have a choice of pillows that will suit your needs? Synthetic pillows are also known as micro-fiber, polyester or hollowfiber pillows, and obviously, are stuffed with a man-made filling. They are light, inexpensive, and are suitable for people with allergies. Their drawback is that they tend to get flat, clumpy and out of shape relatively quickly, and so need replacement faster than other types. Feather pillows are made from the back and wing feathers of geese and ducks. Manufacturers add a little bit of down to the stuffing of feather pillows to make them softer, as feathers alone tend to be rough. They’re easy to form into your desired shape and are long-lasting and inexpensive. However, after a while the sharp part of the feathers tend to come out of the cover and they’re not the best pillows for side sleepers with neck pain, as they’re not thick enough to provide good support. Plus, if you have allergies, they may make you sneeze. But if you’re a back sleeper and you really like the feel of feather pillows, then they’ll work great for you. Down pillows are stuffed with the very soft under feathers that geese and ducks use for insulation. These do not have the sharp spikes that regular feather pillows have. They are quite the luxury in the pillow world, as they are among the softest and most expensive of pillows, and they last a good long time. However, like regular feather pillows, they’re not the best pillows for side sleepers with neck pain, since they lack support, nor are they the most suitable for people with allergies. Wool pillows are one hundred percent natural and they’re great for allergy sufferers, as the actually repel dust-mites. They’re really good at keeping your head cool, too. They’re heavier and firmer than other pillows, and can be used well by stomach sleepers, or when stacked, by side or back sleepers. What’s also nice about wool pillows too is that they are biodegradable and recyclable. They are a little more expensive than regular pillows, though, and may need to be aired before using if the wool smells too strong. Memory foam pillows is made primarily of polyurethane, and the best part about it is that it reacts to your body shape since it is very sensitive to pressure. Memory foam pillows are sometimes shaped like regular pillows, or can have a contour in the middle for neck pain to support your head and neck. 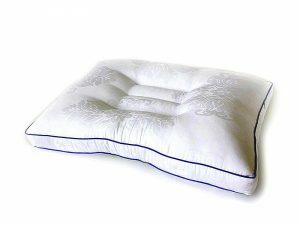 People who have suffered from neck pain have experienced comfort and relief, but others who’ve used these pillows have gotten quite warm in the night. They are also a bit more expensive than most pillows, and sometimes come with a distinct chemical smell. Shredded memory foam pillows are made of memory foam that’s been cut into many bits and pieces. 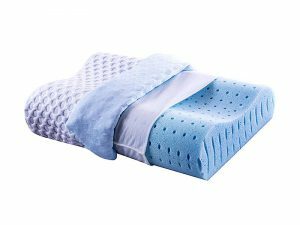 These are the latest in memory foam pillows and they come with the advantage that they are more moldable than traditional memory foam. It has the same kind of “give” as a down pillow, and therefore offers an even more comfortable sleep experience. It’s also cooler and more breathable then regular memory foam. It does, however, have the same chemical smell that memory foam does, and is slightly more expensive. Latex pillows were first offered a few years ago as an alternative to memory foam. They’ve got a few advantages in that they don’t get as warm as memory foam pillows, and they definitely absorb moisture better. Latex does conform to your neck and head, and offers good support for people with neck pain. However, it doesn’t have the same “give” as memory foam does, which means that the height of your latex pillow will pretty much remain the same, and won’t adjust to the height of your head. It is also generally more expensive and heavier than memory foam. Just make sure you buy the right height for your head. Latex pillows are very firm, and do a good job in keeping your head, neck and shoulders in alignment. Micro bead pillows are filled with many little beads made of polystyrene, which allow this kind of pillow to follow the shape of your head. They’re mostly used in travel pillows, but there are some sleeping pillows made of micro beads as well, since they help support the neck and shoulders well. They can be noisy, though, when you shift positions in your sleep. Water pillows are not very common, however, they do serve some useful purposes. They provide cooling to the body, for people who sweat a lot at night, and they also offer pain relief for sore necks and backs. Depending on the water you put in them, their size or height can also be adjustable. They are understandably heavier and can be more costly than other pillows. Buckwheat pillows are filled with the husks of wheat, and function almost in the same way as microbead pillows, since they offer support and moldable to the shape of the user’s head and neck. You can actually add or subtract buckwheat husks to get the pillow’s height or size that you need. They are said to work well for relieving neck and shoulder pain, but are a little bit more expensive than regular pillows, and tend to be noisy when you move. You can also buy pillows in different shapes, which are sometimes recommended by your doctor for health reasons. A cervical or contour pillow for neck pain has a curved shape that follows your head, neck and shoulders. These are recommended for people who experience neck pain. A wedge pillow is shaped like a triangle, and allows the user greater elevation for the head when lying down. People who suffer from acid reflux experience relief with these pillows. A neck pillow is a horseshoe or “U” shaped pillow usually used for traveling, to keep the traveler’s neck upright. A lumbar pillow is half-moon shape used for neck support during a massage, or behind the lower back to relieve pressure in that area. A body pillow is long and sometimes sausage-shaped. Side sleepers put this pillow under their neck and between their knees for good support. Try different pillows out at the store before you buy it. Go on — don’t be shy. People try out mattresses before they make their final purchases, and they should. If a pillow lasts you at minimum of six months, that’s 1,440 hours that you’ll spend lying on it—and you might as well get your money’s worth. Remember, it’s your comfort and freedom from neck pain that we are talking about, things that directly contribute to your productivity, and even quality of living. Try out different types of pillows to determine what’s best for you. If you’re at the store and you don’t have the opportunity to actually put your head down on a pillow you’re trying out, stand beside a wall in your regular sleeping position. Place the pillow on the wall and put your head on it. Ask a companion or the salesperson if your neck is leaning too much in a certain direction, or if it’s aligned with your spine (which is a sign that it’s a good fit for you). Wait… are you even lying down the right way? Hang on for a second. Is there really such a thing as lying down on your pillow in the right way to avoid neck pain? The answer is yes. There are good ways to lie down that will prevent neck and shoulder pain. For example, if you sleep on your back, only your head and neck should be on your pillow, not your shoulders. It’s also best to have your shoulders parallel to your ears. And your pillow shouldn’t be so high that your chin is pushed down, almost touching your chest, nor should it be so flat that your chin is pointed to the ceiling. Get your chin in neutral position, as this will relax your neck, and allow you to wake up feeling refreshed. This holds true for side sleepers as well. Make sure your chin is also in a neutral position, neither jutting out nor tucked in. Also, make sure not to sleep on your shoulder. Your shoulders need to be relaxed, and not in a shrug position close to your ears. This means that your muscles in the neck and shoulder areas are contracted. What good is having the best pillow for neck and shoulder pain, if you don’t position your body properly? This may take a bit of practice, but believe me, the muscles in your neck, shoulders and even your back will thank you later on. A lot of experts say that taking good care of your pillows — washing them regularly and keeping them in good condition — will prolong the life of your pillow, not only saving you money but allowing you the comfort of a good night’s sleep without having to adjust to a new pillow too often. Please keep in mind that the type of cleaning method for pillows always depends on the filling inside. And, no matter what, always read the label on the pillow carefully before you even start washing it. If you are someone who snips the label off as soon as you get home from the store, make sure that you keep it somewhere so that you can refer back to it when your pillow needs cleaning. Pillows stay clean when they are washed every three months, or at least twice a year. This will remove any dead insects, dirt, oil and dead cells from your skin. This is especially good for allergy sufferers, because dust mites can lodge in the recesses of your pillows. Synthetic (micro-fiber, polyester or hollowfiber) and down pillows can go directly in the washing machine, and so can microbead pillows, on the gentle or regular cycle, using a minimum amount of detergent. Run the rinse cycle twice to make sure you get all the soap out. It’s a good idea to wash two pillows at a time, to keep your washing machine balanced. When running your pillows through the dryer, use low heat and throw in some clean tennis balls to keep the stuffing from clumping inside your pillows. You may also want to fluff them often, so they keep their shape nicely. Water pillows can also be machine washed, but make sure to empty all the water out of them first, and keep the cap on while washing. Wool pillows require hand washing, as do memory foam and latex pillows. You might also want to vacuum your memory foam pillow before washing it, to get it extra clean. Wash them in gentle detergent, and air dry in a warm room. Fluff and plump your wool pillow as it dries to make sure it doesn’t clump. Now, a memory foam pillow can retain a lot of water, so make sure it’s completely dry before using it again, lest mildew or mold grow in it. For your latex pillow, pressing towels to all sides of the pillow after washing it will cause the absorption of excess moisture, and make drying faster and easier. Note: while you can dry your wool pillows in the sun, this is not advisable at all for memory foam and latex pillows, which could degrade when placed under direct sunlight. Buckwheat pillows should not be washed, as water will destroy the filling. What you can do is to empty the hulls into a clean pillowcase, and then wash the cover your buckwheat pillow came in. You can also lay the hulls on a cookie sheet in a sunny spot in your house. Don’t lay them outside, as the wind might blow them away. When the cover is dry and the buckwheat hulls have been aired, simply put them back in. Final tip: When is it time to replace your pillow completely? Here’s a good rule of thumb. If you have a synthetic pillow, which is the most common kind, fold in in half crosswise. If it doesn’t spring back into shape—it’s probably time to say goodbye. Here’s an even more important tip. If you are waking up to pain in your head, neck or shoulders several times a week, then it’s definitely time to change your pillow and find one that suits you best by keeping your head, neck and shoulders all aligned. Or, if you sleep at a hotel and you wake up rested and pain-free, that’s also a good indication that you need a new pillow for your bed at home. 1. What is the best pillow for side sleepers with neck pain? If you’re a side sleeper, you definitely need sufficient support for your neck, since there’s a larger space between your head and your bed, because your shoulder is in between. The pillow you choose must keep your head in a straight position so that your neck stays aligned to the rest of your body. The best pillows for side sleepers with neck pain are usually made of memory foam or latex. And for those who don’t prefer memory foam pillows, there are down buckwheat, down and even water pillows for side sleepers who suffer from neck pain. 2. How do you choose the best pillow for neck and shoulder pain? As I’ve said earlier, the first step is determining your sleeping style. If you’ve been waking up with pain in your neck and you’re pretty sure that it’s your pillow at fault—the first thing to do is to find out the position you take when you fall asleep, as well as the one you wake up with. Next, examine the pillows you have now. Are they too flat already, failing to give your neck and head support, or are they too thick, causing your neck to jut too far forward? Ask yourself what kind of pillow you need that will make your head completely aligned with your neck and spine, and what filling material works best for you. 3. What is the best pillow to prevent neck pain and headaches? There is not one definitive answer to that question, since we all have different sleeping styles. When choosing the best pillow to prevent neck pain your objective is to find one that will keep your position in what experts call neutral alignment, meaning your head is solidly on your shoulders, neither thrust forward nor bending back. Does it bridge the distance between your head, neck and spine? Is it good for your sleeping habits? Does it keep your neck in an aligned and stable position? When you can answer these three questions, you’ve found the best pillow that will prevent you from suffering from neck pain. 4. Are there any forums for the best pillow for neck and shoulder pain? 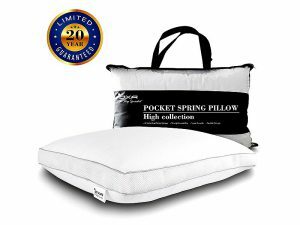 Best pillow for deeper, more restful and neck pain free sleep? 5. What is the best memory foam pillow for neck pain? There are a lot of excellent memory foam pillows out in the market today, but let me just give you three based on their price points. For an inexpensive model, try out the Sleep Whale – Premium Shredded Memory Foam Pillow, priced below $25. It’s got shredded memory foam instead of a solid block, but provides very good neck and back support. The second one is the Conforma Cushion Firm Memory Foam Pillow, fairly reasonably priced below $40, and also gives good support to your neck and shoulders. Finally we’ve got a double contour pillow for neck pain, the Memory Foam Neck Pillow from Profile, a model that’s chiropractor approved because it helps relieve neck pain. 6. What is the best orthopedic pillow for neck pain? I would have to say Nature’s Guest Cervical Support Pillow, a contour pillow for neck pain that has maximum neck support. This pillow has everything you’d want in an orthopedic pillow, as it provides total spinal, neck and head alignment while you sleep. Unlike other pillows, this one is adjustable, so you can tailor fit the thickness that is most comfortable for you. The neck roll cushion that’s been built into the design is also a definite plus. 7. What’s the best pillow for cervical neck pain? I’m going to go for something tried and true here — the best pillow for cervical neck pain might just be Original Bones’ NeckBone Chiropractic Pillow. 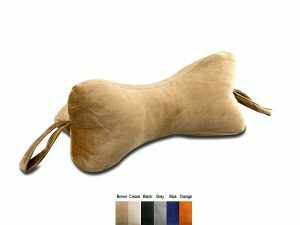 This pillow’s unusual bone shape causes your neck, shoulders and back to be in perfect alignment. At the same time, it also puts the right amount of pressure that you need for your muscles to relax and rest. It may take a little getting used to, but this bone-shaped pillow really works. 8. 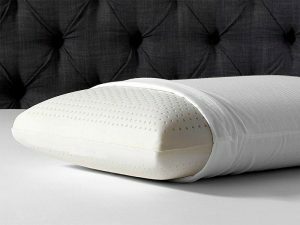 What’s the best pillow for neck and shoulder pain if you sweat a lot at night? I understand this question well, because pillows for neck pain are usually made of memory foam, which can get quite warm in the night, especially during the summer months. Your best bet is to look for a memory foam pillow with a cooling component. One example of this is the CR Sleep Ventilated Memory Foam Contour Pillow with AirCell Technology. This pillow has gel-infused covers that keep the pillow ventilated, and keep you cool as you sleep. 9. Why do some pillows for neck pain have uneven sides? Some contour pillows for neck pain don’t just have a recess in the middle, but have one side that is higher than the other. This is because there are hardly any people who only have one sleeping style, more often than not, we are combination sleepers. Pillows with uneven sides make allowances for people who need the higher side when they sleep on their backs or sides, and the lower side for when they sleep on their stomachs. 10. Are there pillows for neck pain whose height or thickness can adjust? The good news is that, yes, you can find this kind of pillows. Nature’s Guest Cervical Support Pillow is fully adjustable, that is, you can remove some of the filling if you find the pillow to be too thick to be comfortable. Newer models of the NeckBone are also adjustable, so you can get your desired thickness. The good news is that you can actually say goodbye to neck pain when you find the right pillow. To someone who has never woken up with a stiff neck, or never suffered from pain when they moved their head from side to side or up and down, this may not mean much. But for those of us whose quality of life has been affected by pains in our neck, head, and backs because we had the wrong pillow, this is a reason to rejoice. Technology has advanced in such a way that we can find the pillow that’s best for us, so that we wake up rested, refreshed and ready for our day. Is there such a thing as the perfect pillow for everyone? Absolutely not. There are a whole range of pillows for neck pain that cater to your specific needs for thickness, softness, firmness, type of preferred filling material, even size and shape. Pillows are not one-size-fits-all, and there is a pillow out there that is perfect for you.